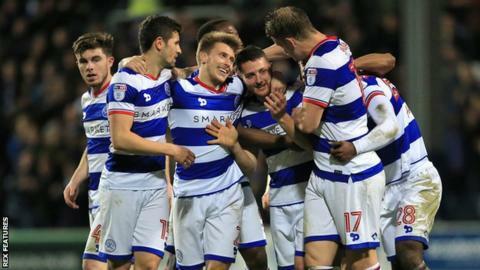 Wigan Athletic remain in the Championship's bottom three as goals from Matt Smith and Conor Washington earned QPR victory at Loftus Road. Washington crossed for Smith to sweep in Rangers' opener from 12 yards, his second goal in two games. Omar Bogle levelled for the visitors, scoring from the penalty spot after he had been brought down by Joel Lynch. Washington's finish from the edge of the area won it for Ian Holloway's men, who are 10 points above the drop zone. Wigan, who had taken four points from their previous two matches without conceding a goal, would have moved out of the relegation zone with a win but they found QPR goalkeeper Alex Smithies in excellent form. Smithies denied Bogle a second goal and kept out Jake Buxton efforts either side of half-time before Washington's winner. Having struggled to find the net frequently under previous QPR boss Jimmy Floyd Hasselbaink, the former Newport and Peterborough striker has now scored four goals in six appearances for the west London club. "We got an ugly win but the character has come and you can see that the lads are growing. "The work-rate is there. They're all wearing the shirt with so much pride. Even if we had drawn that game I still would have been happy with their effort. I can't ask for any more from any one of them. "We're getting that feeling that we can win games, and that's absolutely vital. We need a feeling that we can be good at this level and are moving forward." "They were two poor goals to concede. For the first goal we were wide open to a long kick down the middle. We did well to come back and were good value for the 1-1 at half-time. "We were certainly under plenty of pressure from how direct they were. We know the lad (Matt Smith) wins a lot of balls in the air and that we had to get to the second ball. "For the second goal we don't pick the second ball up - it's straight through on the back four. "They were poor goals, not goals where you're carved open. The fitness and desire were there and we could have got an equaliser near the end." Match ends, Queens Park Rangers 2, Wigan Athletic 1. Second Half ends, Queens Park Rangers 2, Wigan Athletic 1. Attempt missed. Luke Freeman (Queens Park Rangers) left footed shot from outside the box is too high. Kazenga Lua Lua (Queens Park Rangers) wins a free kick on the left wing. Foul by Callum Connolly (Wigan Athletic). Idrissa Sylla (Queens Park Rangers) wins a free kick in the attacking half. Foul by Dan Burn (Wigan Athletic). Foul by Yeni N'Gbakoto (Queens Park Rangers). Dan Burn (Wigan Athletic) wins a free kick in the defensive half. Kazenga Lua Lua (Queens Park Rangers) wins a free kick in the defensive half. Ryan Tunnicliffe (Wigan Athletic) wins a free kick in the defensive half. Foul by Idrissa Sylla (Queens Park Rangers). Substitution, Wigan Athletic. Mikael Mandron replaces Jamie Hanson. Offside, Wigan Athletic. Gabriel Obertan tries a through ball, but Omar Bogle is caught offside. Idrissa Sylla (Queens Park Rangers) is shown the yellow card for a bad foul. Stephen Warnock (Wigan Athletic) wins a free kick in the defensive half. Substitution, Queens Park Rangers. Idrissa Sylla replaces Matt Smith. Foul by Gabriel Obertan (Wigan Athletic). Joel Lynch (Queens Park Rangers) wins a free kick in the defensive half. Foul by Omar Bogle (Wigan Athletic). Substitution, Wigan Athletic. Gabriel Obertan replaces William Grigg. Attempt missed. Yeni N'Gbakoto (Queens Park Rangers) right footed shot from outside the box misses to the right. Assisted by Kazenga Lua Lua. Foul by Ryan Manning (Queens Park Rangers). Jamie Hanson (Wigan Athletic) wins a free kick in the attacking half. Attempt blocked. Omar Bogle (Wigan Athletic) left footed shot from the centre of the box is blocked. Assisted by Ryan Tunnicliffe. Substitution, Queens Park Rangers. Yeni N'Gbakoto replaces Conor Washington because of an injury. Sam Morsy (Wigan Athletic) wins a free kick in the defensive half. Corner, Queens Park Rangers. Conceded by Dan Burn. Kazenga Lua Lua (Queens Park Rangers) wins a free kick in the attacking half. Attempt blocked. Ryan Tunnicliffe (Wigan Athletic) right footed shot from the left side of the box is blocked. Assisted by Max Power with a cross. Attempt missed. Luke Freeman (Queens Park Rangers) left footed shot from the centre of the box is too high. Assisted by Jake Bidwell with a cross. Jake Buxton (Wigan Athletic) is shown the yellow card for a bad foul. Kazenga Lua Lua (Queens Park Rangers) wins a free kick on the right wing. Foul by Jake Buxton (Wigan Athletic). Goal! Queens Park Rangers 2, Wigan Athletic 1. Conor Washington (Queens Park Rangers) right footed shot from outside the box to the bottom left corner. Assisted by Kazenga Lua Lua.